Talk about styling and this new generation Figo surely won’t disappoint. 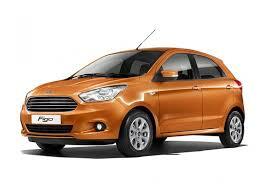 Ford has already launched the Figo Aspire which is actually the same Figo hatch with an additional boot, so all of you actually have a very distinctive idea about the new Figo hatch styling. Towards the front the new generation Figo, gets the same trapezoidal grille which looks quite aggressive while the dynamic and sleek styling is what sets it apart from the rest of its competition. Apart from the bold looking trapezoidal grille the hatchback also gets elongated headlamps up front as well. The side profile of the vehicle looks identical to the compact sedan. The top end Titanium+ also gets an impressive alloy wheels as well. While towards the rear the well proportioned tailgate with stylish set of taillamps enhances the overall appeal. What else helps in enhancing the overall appeal is the accentuated character line which runs through the lamp clusters and also gives us an idea of the overall width of this hatch. The bold shoulder line merges perfectly with the taillamps as well which helps in adding the sense of movement even when the hatch is not in motion.